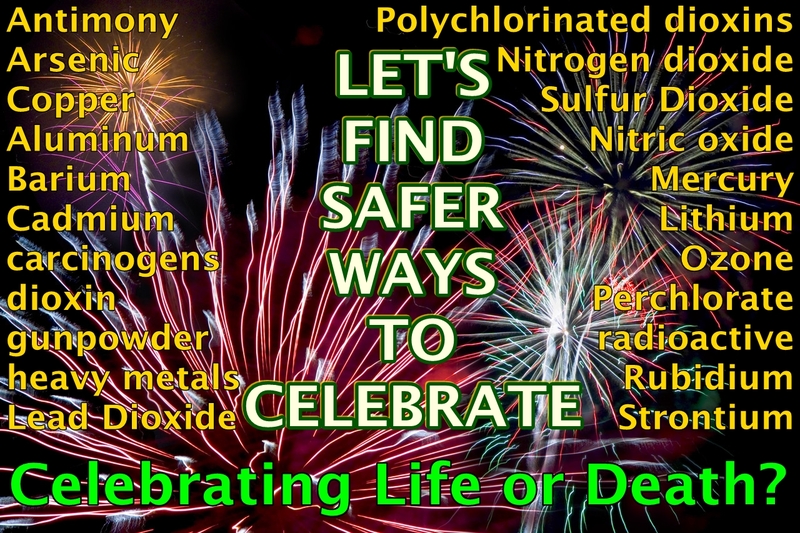 This entry was posted in Air Quality, Environmental Health, Pollution and tagged 4th of July, Canada Day, celebrations, dangerous substances, fireworks, Independence Day, noise, pets, toxic pollutants. Bookmark the permalink. Why are these expensive and toxic displays still happening? Because the right to pollute our air, water, and bodies is more important to some people than finding safe ways to celebrate life! “”If finalized, EPA and the Army Corps of Engineers’ proposal to expand the Clean Water Act’s definition of the ‘waters of the United States’ may enable litigious environmental groups to jeopardize fireworks displays throughout the country,” the letter, spearheaded by Sen. David Vitter (R-La. ), adds. Republicans in Congress have called the rules a “power grab,” but the EPA has stressed the proposal does not expand protections. The rules require that the EPA and Army Corps approve any project that might pollute the protected waterways already under their jurisdiction, keeping in place exemptions for farming, ranching and forestry practices. Which is why we need the legal and constitutional right to a healthy environment instead of the right to pollute! It’s hard to say ban fireworks, it’s such a treat and source of joy during holidays when people want to loosen up and celebrate. But there must be safer alternatives. I live in a moderately sized southern city and our fireworks display this year was MASSIVE. I live near downtown and the putrid clouds of residual smoke and toxins lingered for a while. Some people can deal with that toxic cloud (once or a few times before getting really sick) but more and more people and wildlife have already passed tipping point re what pollutants are doing in our bodies (asthma, autism, cancers, chemical injuries, learning disabilities, MS, Parkinson’s, etc etc). “The UGC had last year directed all the universities in the country, including DAVV, to include a module on ill-effects of fireworks in the paper on environment studies for undergraduate courses. Last year we could not prepare the module but this year we are not only going to prepare it but also implement the same,” said incharge registrar Ajay Verma. He stated that the university will take help of Madhya Pradesh Pollution Control Board for preparing the module.